Coxswain Allen Frary took Wells Lifeboat to sea today for his last exercise prior to his retirement after 42 years on the crew, 21 as Coxswain. The boat made several crew changes in the outer harbour so that crew, launchers, station personnel and guests could all come aboard. VIPs included station Vice President Sarah, Countess of Leicester, Tom Hill, MOD Chairman of the Civil Service Lifeboat Fund (which has so generously raised funds towards the station's forthcoming Shannon lifeboat), as well as old friends and former colleagues from the RNLI. 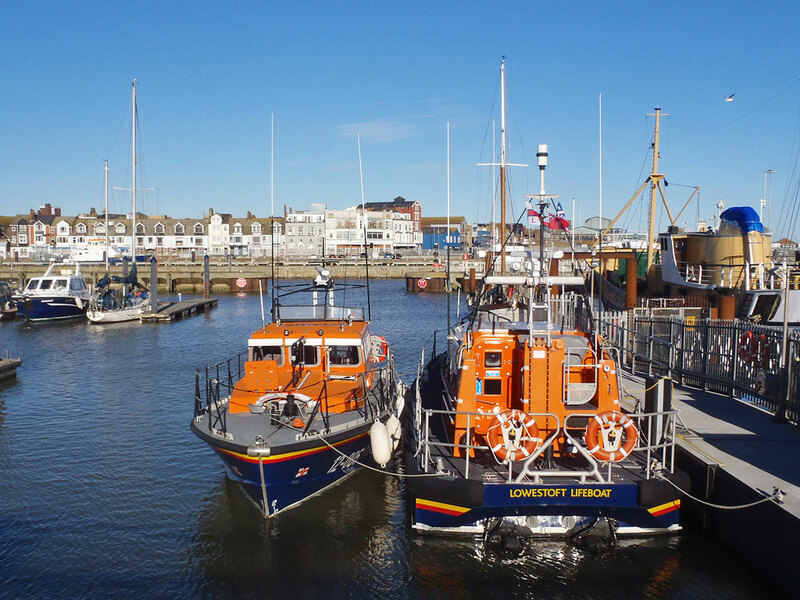 Wells Mersey class lifeboat and D-class inshore lifeboat were joined off Wells by Sheringham Lifeboat and Cromer Lifeboat who cruised along the coast from their stations to give Allen a fitting send-off. After recovery, a celebration was held at the Golden Fleece pub on the quayside which kindly provided drinks and a splendid buffet. Our thanks to all who came and helped to make this a special day and our best wishes to Allen for his retirement. Allen has served as a member of the Wells lifeboat crew for 42 years and has been coxswain/mechanic for 21 years. He has received numerous commendations, including one for the rescue of the Dutch sailing vessel Albatros off Bob Hall's Sands and a velum award for rescuing a yacht caught on Wells Bar inheavy weather. Thanks in no small part to Allen's work, the station has sufficient well-trained personnel to cover his duties until his replacement is appointed. This was recently put to the test when he suffered a serious injury to his back and was confined to quarters for 18 weeks. Allen has made a full recovery and is looking forward to a long and active retirement. The crew and volunteers thanked him for his service and wished him all the best for a happy retirement. Operations Manager Chris Hardy said, "Nothing was ever too difficult for Allen. Through his time spent at sea, he can turn his hand to anything. It has been widely recognised within the RNLI, that how he maintained our Mersey class Lifeboat in such a pristine condition, set the standard which was the model for other Lifeboat Stations to follow. He is an excellent seafarer, leader of men, a great ambassador for the Institution and a natural public speaker. It has been a real privilege to work with him and I wish him every happiness in retirement." 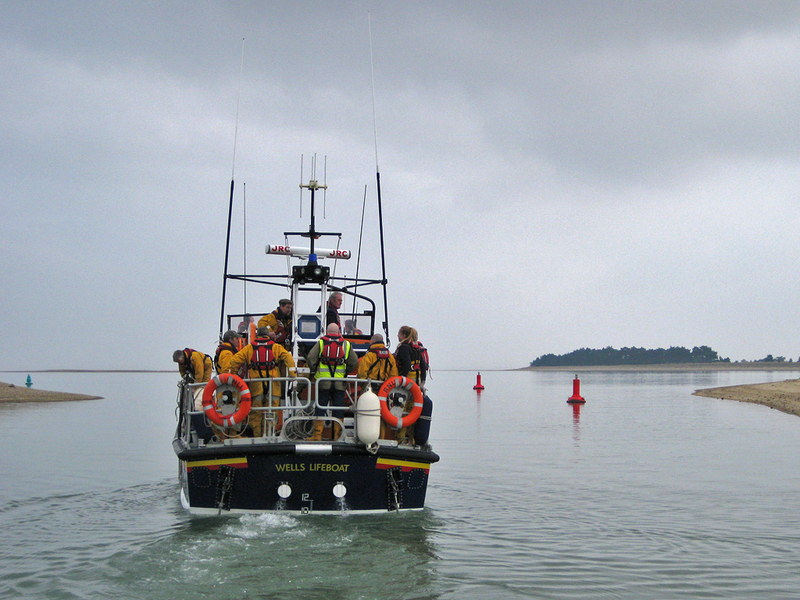 Chairman Peter Rainsford said, "In the various roles that I have undertaken at Wells Lifeboat my work has been made easier and more enjoyable by Allen's guidance and support. He has set a gold standard for the Coxswain/Mechanic's job and has earned great respect around the coast not only for himself but also for the RNLI Wells Lifeboat Station." Plans for the new lifeboat station in Wells to house the forthcoming Shannon-class lifeboat have been submitted to the planning authorities and will be available for the public to view at a specially organised event at Wells Sailing Club on the east quay on Tuesday 5th December. Please drop in at any time from 3pm to 7pm... all our welcome. If you can't make this date, we will have the plans on display at the boathouse at our annual carol service on Sunday 17th December. Bridlington lifeboat is the latest station on the East Coast to swap over from a Mersey class lifeboat to a new Shannon, joining Shannons already in service at Lowestoft, Skegness, Scarborough and Amble. Bridlington's boat 13-22 'Antony Patrick Jones' officially went on service this week. Our station all-weather lifeboat 12-003 'Doris M Mann of Ampthill' is back on service after spending some months in the outer harbour while repairs were made to a leaking engine exhaust which required custom parts to be produced. 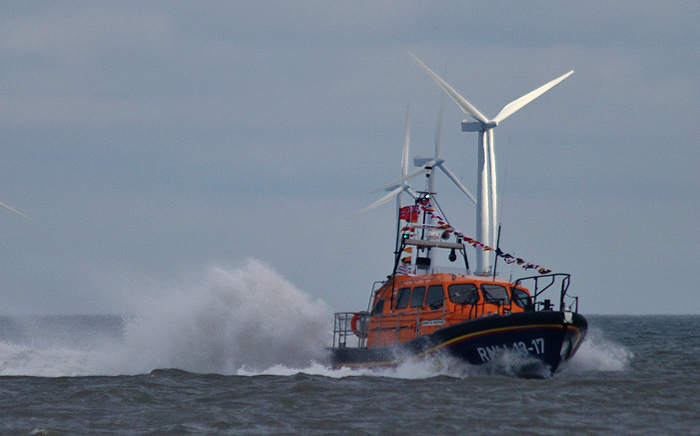 Former Hoylake boat, relief lifeboat 12-005 'Lady of Hilbre' filled in from August onwards, launching twice on service. 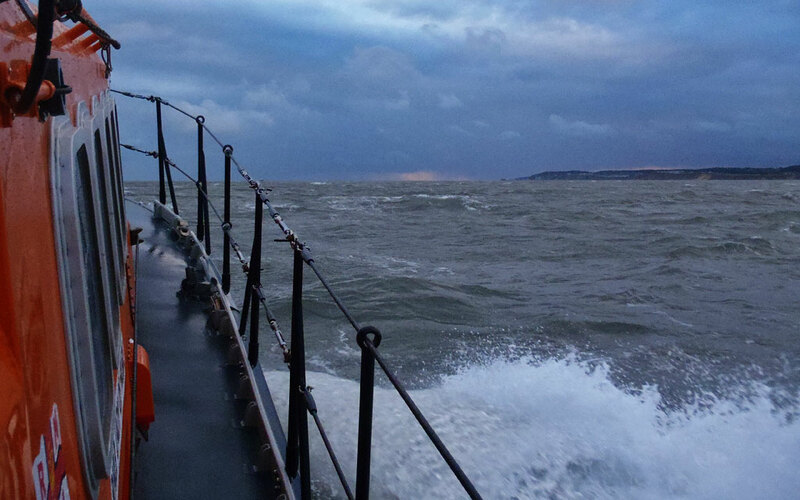 A volunteer crew took 12-005 back from Wells to Ramsgate on 23rd November, stopping briefly at Lowestoft for fuel and a cup of tea during a 9 1/2 hour passage, returning by road the next day. Our thanks to Suffolk-based morris side Barley Brigg who came up on a brief tour of North Norfolk last weekend. 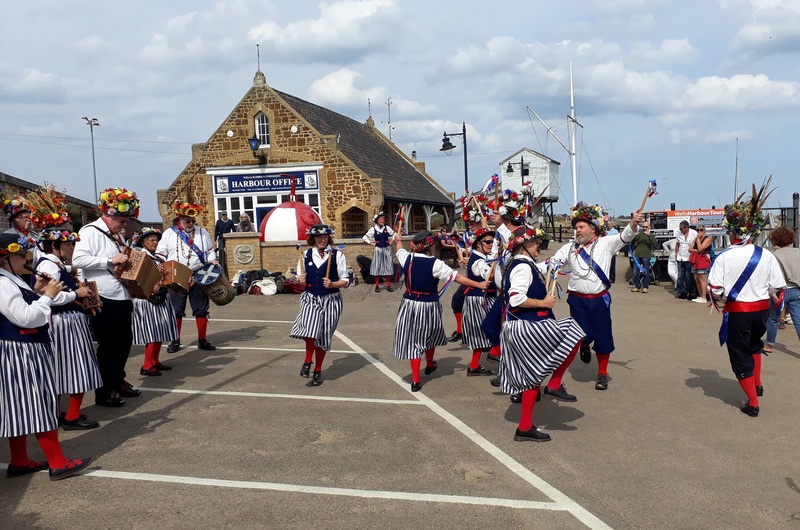 Dancers and musicians performed in Fakenham, Walsingham, Blakeney and Wells over the two days and collected £595 for Wells RNLI. Thanks also to Lewisham Symphonic Concert Band who delighted the audience at a concert at St Nicholas Church in Wells on Saturday night organised by Wells RNLI Guild, raising £767 for lifeboat funds. 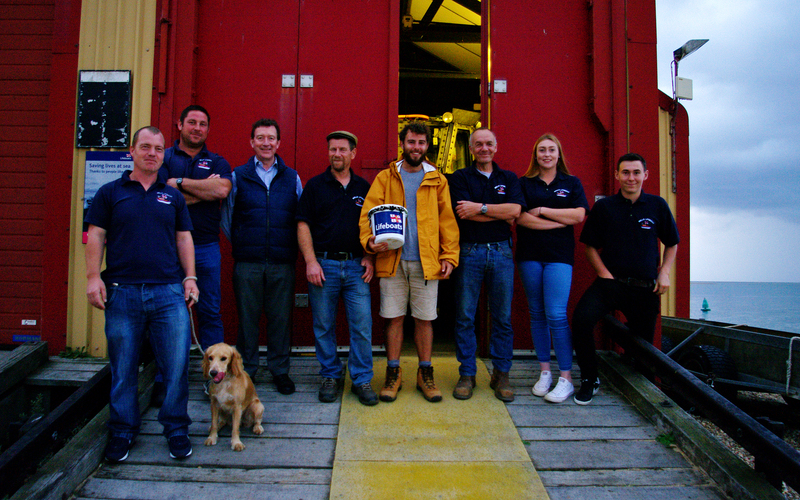 Alex Ellis-Roswell called in at Wells lifeboat station on Tuesday evening where he was welcomed by members of the crew along with chairman Peter Rainsford and Operations Manager Chris Hardy. 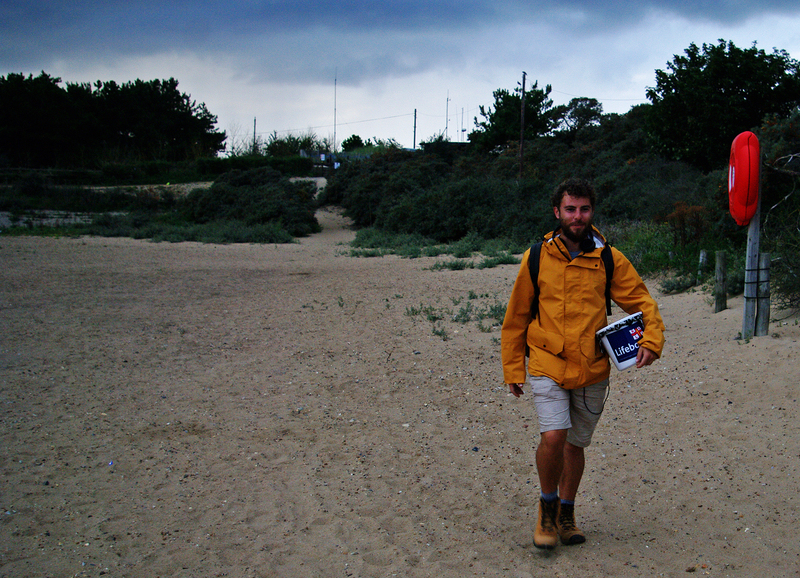 Alex has spent the past 3 years walking the entire coast of Britain and Ireland raising money for the RNLI. He's on the home stretch now, having walked around 9000 miles since starting setting out from Margate in Kent in August 2014 but still has 500 miles or so left to go. 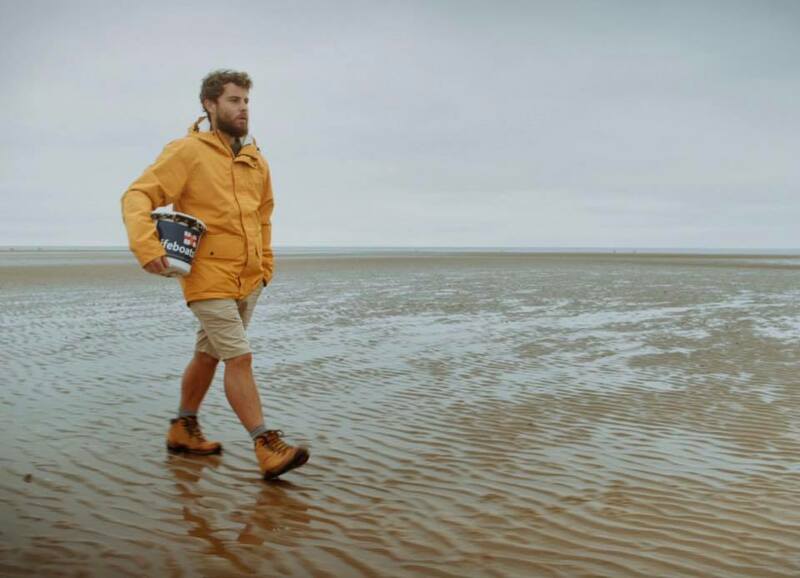 His epic journey has so far raised over £60,000 for the RNLI and Alex arrived in Wells at dusk having walked from Hunstanton, with a further £66 in his RNLI collection bucket. We are hugely grateful for his support for the lifeboats and wish him the best in the final weeks of his walk. Our thanks too to those who helped with Alex's bags and lifts and to Ben and Imelda for putting him up. Do say hello if you see Alex on his way down through Norfolk, Suffolk, Essex, London and Kent. He'd also be grateful if anyone could help with putting him up along the route...please message him on Facebook. Look out on the Norfolk coast path for Alex Ellis-Roswell who is walking the entire coast of Britain and Ireland. Alex started his epic journey in 2014 and so far as walked over 9000 miles and raised over £55,000 for the RNLI. He's on the home stretch now but still has hundreds of miles and the wonderful coasts of Norfolk and Suffolk to go. We hope to welcome Alex in Wells in the next day or so. Alex would be hugely grateful if anyone could help with putting him up overnight along the route...please message him on Facebook. 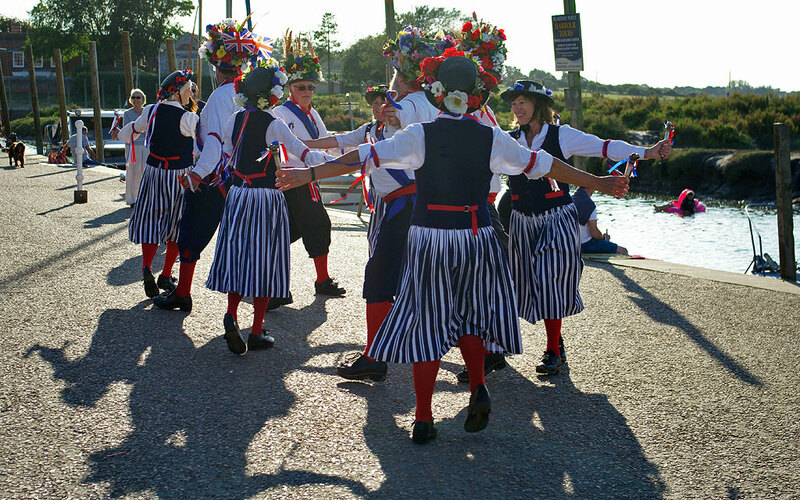 Look out next weekend for Suffolk-based morris side Barley Brigg on a brief tour of North Norfolk kindly raising funds for Wells RNLI. 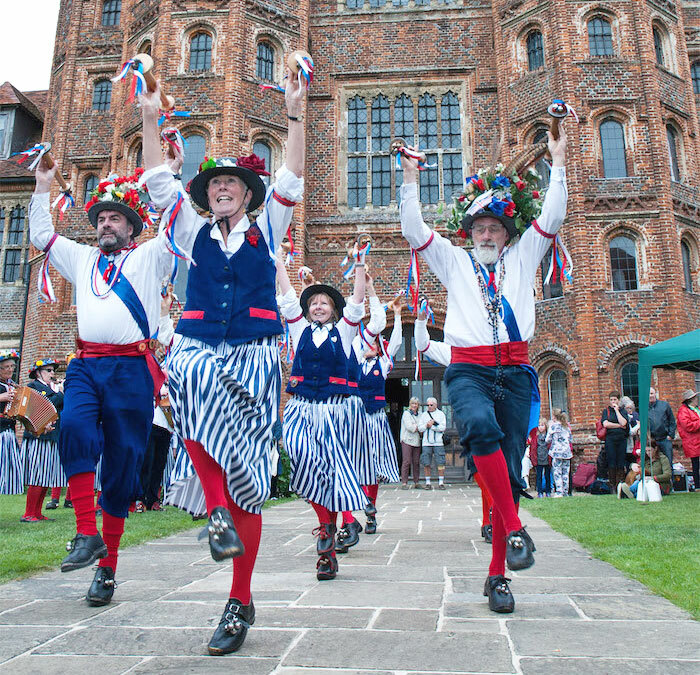 Barley Brigg, a mixed morris side from Yoxford in East Suffolk dances the North-West tradition of morris which means colourful costumes and clogs with bells. They are instantly recognisable, with their patriotic colours of red, white and blue and impressive flowery hats!